Nucor Corporation’s NUE stock looks promising at the moment. We are positive on the company’s prospects and believe that the time is right for you to add the stock to portfolio as it looks promising and is poised to carry the momentum ahead. Let’s delve deeper into the factors that make this steel company a compelling choice for investors right now. What’s Working in Favor of NUE? Solid Rank & VGM Score: Nucor currently sports a Zacks Rank #2 (Buy) and a VGM Score of A. Our research shows that stocks with a VGM Score of A or B, combined with a Zacks Rank #1 (Strong Buy) or #2, offer the best investment opportunities for investors. Thus, the company appears to be a compelling investment proposition at the moment. An Outperformer: Nucor has outperformed the industry over a year. The company’s shares have gained around 16.9% over this period, compared with roughly 6.7% growth recorded by the industry. Strong Growth Prospects: The Zacks Consensus Estimate for earnings for third-quarter 2018 for Nucor is currently pegged at $2.33, reflecting an expected year-over-year growth of 194.9%. Moreover, earnings are expected to register a 121.4% growth in 2018. The company also has an expected long-term earnings per share growth rate of 12%, higher than the industry average of 10%. 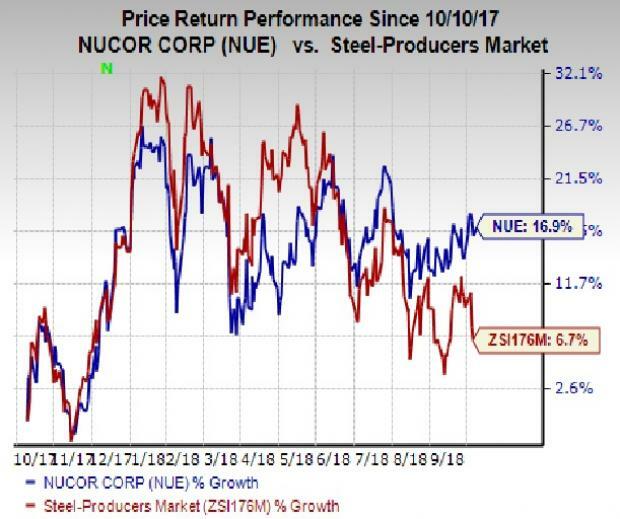 Superior Return on Equity (ROE): Nucor’s ROE of 16.2%, as compared with the industry average of 13.3%, manifests the company’s efficiency in utilizing shareholder’s funds. Upbeat Outlook: Nucor, last month, provided its guidance for third-quarter 2018. The company expects earnings per share in the band of $2.35-$2.40 for the quarter. That is an increase from $2.13 in the previous quarter and 79 cents in the year-ago quarter. The projected earnings for the third quarter include an expected benefit of roughly $25 million or 6 cents, associated with insurance-related recoveries. Nucor expects earnings in the third quarter to maintain the strong performance trend this year as it believes that there is sustainable strength in steel end-use markets. It also expects performance of its steel mills division to increase sequentially in the third quarter, primarily owing to higher earnings in the sheet mills and plate mills, which offset the impact of weather-related and planned outages at some mills. Other top-ranked stocks worth considering in the basic materials space include KMG Chemicals, Inc. KMG, Celanese Corporation CE and Cabot Corporation CBT. KMG Chemicals has an expected long-term earnings growth rate of 28.5% and sports a Zacks Rank #1. The company’s shares are up roughly 23% over the past six months. You can see the complete list of today’s Zacks #1 Rank stocks here. Celanese has an expected long-term earnings growth rate of 10% and carries a Zacks Rank #1. The company’s shares have gained around 5% over the past six months. Cabot has an expected long-term earnings growth rate of 11% and carries a Zacks Rank #2. The company’s shares have gained around 16% over the past six months.